Cross the bridge and head south from there. London is a massive, sprawling monster of a city, with many, many corners to explore. Yet, I’ll save you some trouble by letting you in on a local secret – the most eastern corner of the city is the place to be, for many reasons. 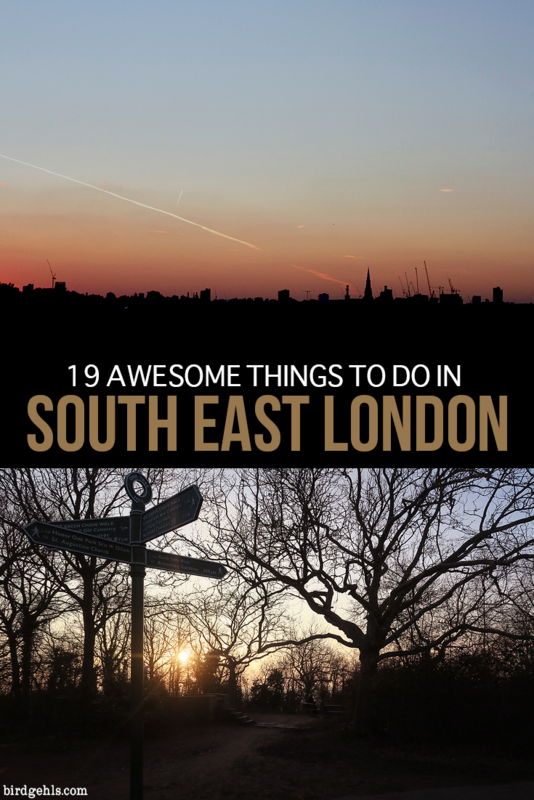 Especially because there are so many neat things to do in south east London. Not only is the area cheaper to live in than other parts of the city – it’s filled with green spaces, hip cafés and restaurants and more history than you could ever imagine. So, get off the well-trod paths within the UK capital and head somewhere new. Here’s what you can get up to in south east London. Bermondsey is a good place to start, being a hop, skip and a jump away from London Bridge… and the suburb’s eponymous street has plenty of places to catch a decent meal. 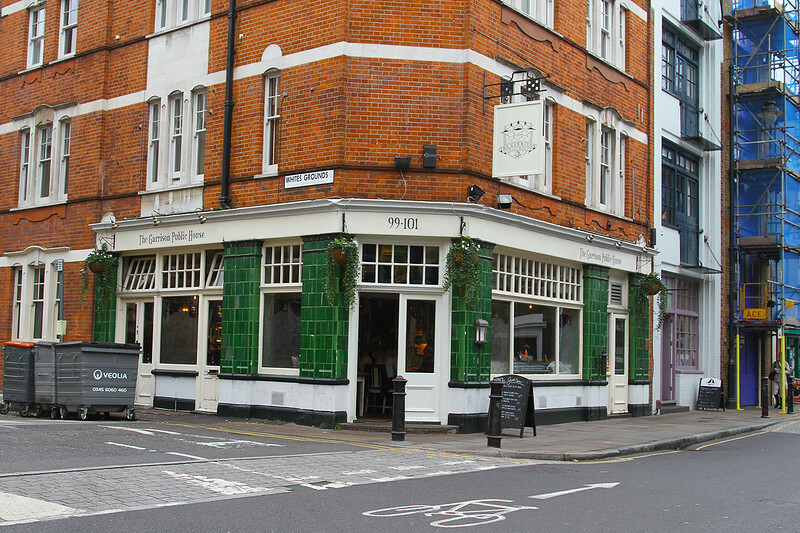 I like The Garrison for a pub meal, the Bermondsey Exchange for brunch, Casse-Croûte for fancy French-fare and The Watch House and Fuckoffee for hot drinks and snacks. 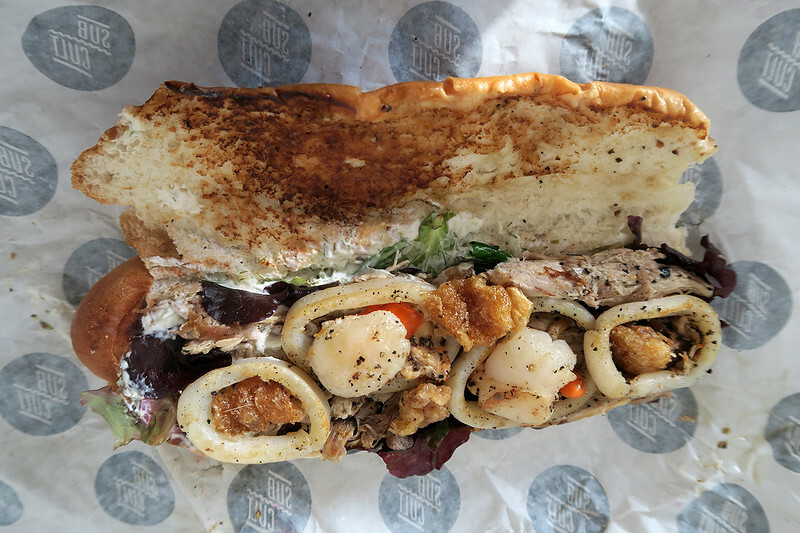 However, there are more than enough places lining the street to grab a bite to eat. If you’re weekend brunching however, make sure you get in before 11am, as most places switch over to their lunch menu at that time. No one seems to understand the fundamental rule of brunch in London, in that it needs to last all day. Sunset on top of One Tree Hill in Honor Oak. Honor Oak Park is a funny little pocket of south east London with an interesting history. Within the park, on the hill (known as “One Tree Hill”), there sits an oak tree – one that has been planted in commemoration of a tree that once stood there, which was destroyed by lightning in 1888. It’s said that Queen Elizabeth I rested under the previous oak at the summit, on her way to visit Lewisham in 1602. There’s also a rumour that Her Majesty was a little bit tipsy at the time and thought it would be a brilliant idea to knight the tree, so that it became the “Oak of Honor” (in ye olden times, this was how “honour” was spelt in British English). As much as I would love this to be true, I guess we’ll never know for sure (so, let’s pretend that it is, because it’s more fun that way). Regardless, the park is quiet and peaceful, plus it offers up a glorious view of the city of London from the hill’s summit. 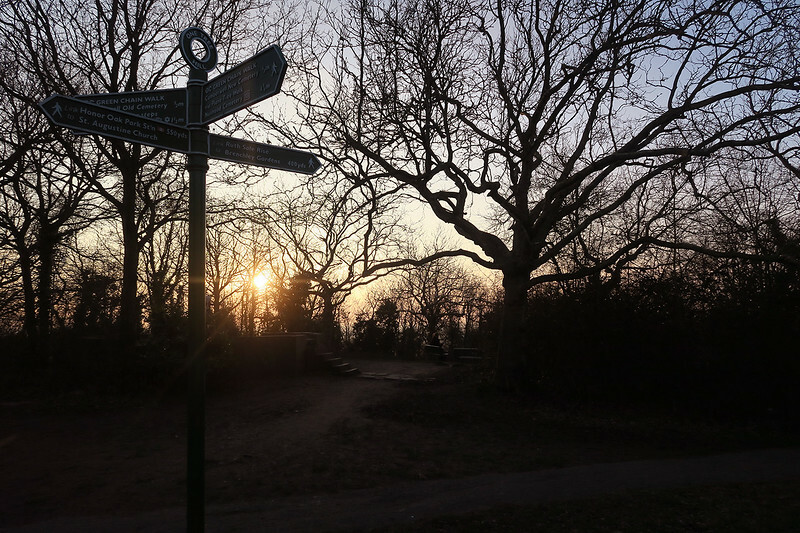 Many of the historic sights in South East London are part of a circuit known as the Green Chain Walk. The walk is 50 miles (80kms) in length and is divided into 11 sections. Plenty of the sites can also be accessed by bus or train, so you can choose to either walk the whole thing yourself, or see the highlights via public transport. On a personal note, I meant to walk it when I lived in SE London, but I am a fundamentally lazy person who thought they had all the time in the world. I don’t live in London anymore, so I clearly didn’t. Here’s a lesson – DO THE THINGS YOU WANT TO DO, WHEN YOU CAN DO THEM BECAUSE TIME WAITS FOR NO (HU)MAN. Regardless, walking is good for the soul and England is indeed a very walk-able country (weather permitting, of course). 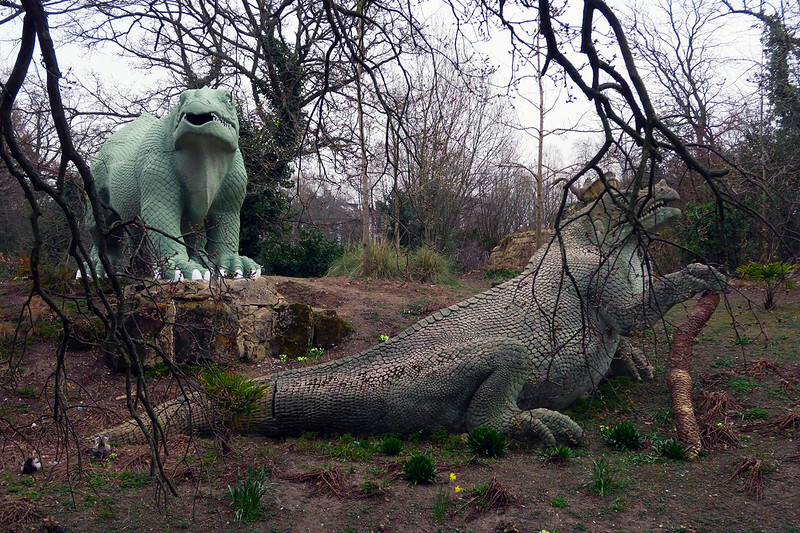 Some of the dinosaur statues at Crystal Palace Park. Crystal Palace’s dinosaurs are an oddity. Completed in 1854, they pre-date Darwin’s theory of evolution, which was published in his book On the Origin of Species in 1859. Scientists of the 19th century had collated nowhere near the amount of information on our prehistoric friends that we now have available to us. As a result, many of the sculptures of these dinosaurs were created on speculation, rather than solid fact. In some cases though, the sculptures seem spot on the money (and some are ridiculously off the mark, making it all the more amusing). Either way, the heritage-listed dinosaurs are well worth the journey to Crystal Palace and the park is a lovely place to wander around in, or for a picnic. And why is Crystal Palace named as it is? Well, it was once home to an enormous glass structure built to house the Great Exhibition in 1851. The event was in Hyde Park, but the Palace was relocated to South London where it stood from 1854, until it was destroyed by a fire in 1936. The remains of the upper terrace can still be seen on the site today. The view from on top of the Bussey Building in Peckham. There’s a lot going on in, around and on top of Peckham’s Bussey Building (I happen to really like the Yoga studio there), but if you’re in want of a decent night out, head to CLF Art Cafe. Located on Block A of the building, the venue features theatre, workshops and dance events and is home to the world’s biggest soul night (known as The South London Soul Train). And don’t forget your locally brewed craft beer. Deptford Cinema is one with a difference. One of the very few cinemas in the borough of Lewisham (there weren’t any when I moved there in 2015 – now there are two), it’s set apart by the fact that it is community run. Volunteers are invited to help discuss and schedule its very alternative program. Tickets are generally as cheap as chips too (for London), usually around the £6.00 mark. The venue is intimate and licensed. What more could you ask of a cinema? My favourite sub sandwich from Brockley Market. 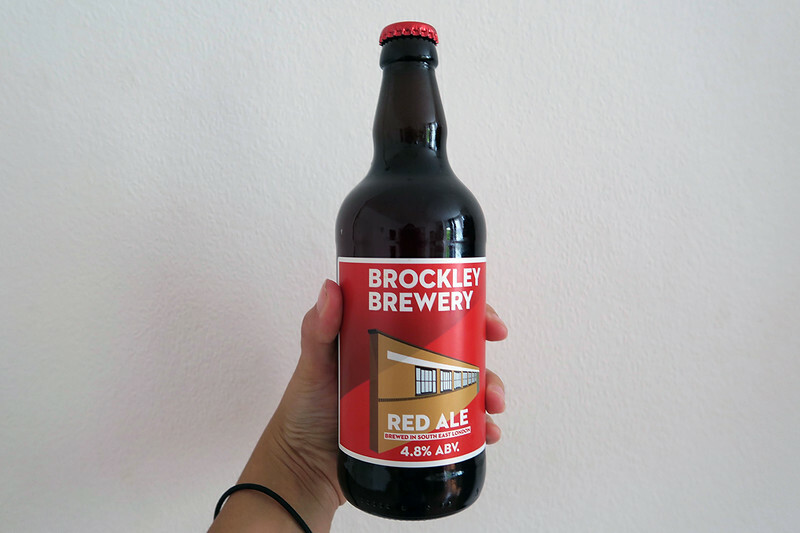 Unlike the bigger markets of London, Brockley is one that feels like it’s more for the locals. Open 10am-2pm every Saturday, you can go there for fresh produce, cheese, fish, meat. Hungry now? Well, there are plenty of coffee stands and food trucks to choose from. Best of all, nearly everyone brings their dogs and are totally okay with you patting them. I should know. Although it is one of the bigger (and notably free) museums in London, the Horniman doesn’t see nearly as many crowds as say, the British Museum or the Museum of Natural History, probably due to its location. It can be found in an area known as Forest Hill, about a ten minute train trip from London Bridge. If you’re looking for free things to do in south east London, it fits the bill as there’s no cost on entry. The Horniman mostly plays host to what was the collection of Frederick Horniman, a tea trader and avid traveller who had a penchant for collecting souvenirs while exploring. These were notably related to natural history, cultural artefacts and musical instruments. 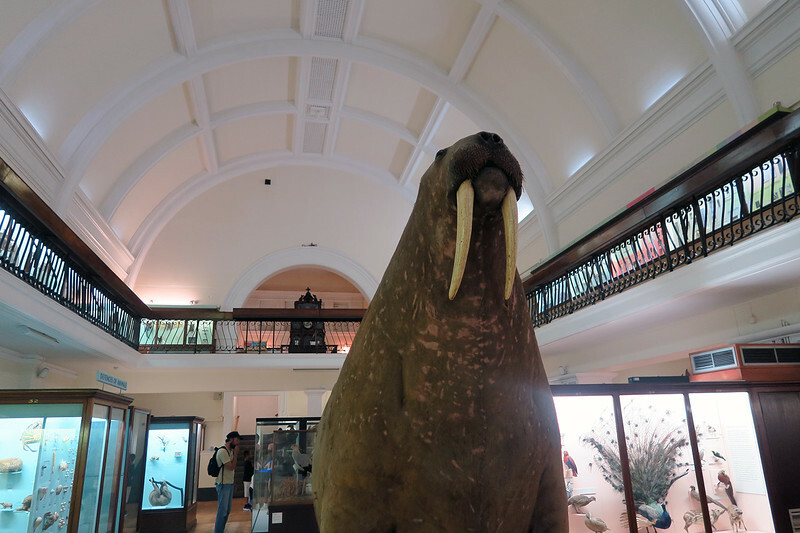 The museum is best known for its collection of taxidermy, particularly its gigantic stuffed Walrus, which has been on display at the museum for over a century. Walrus sightings within the Victorian era were rare and as a result, no one had a clear idea of what a Walrus actually looked like. Not realising that the animal’s skin featured natural folds or wrinkles, the Horniman Walrus was overstuffed by the taxidermists. His skin is dimple-free. This has only helped to increase his popularity. People journey to the museum just to see the Walrus and and he even tweets from his own twitter account. 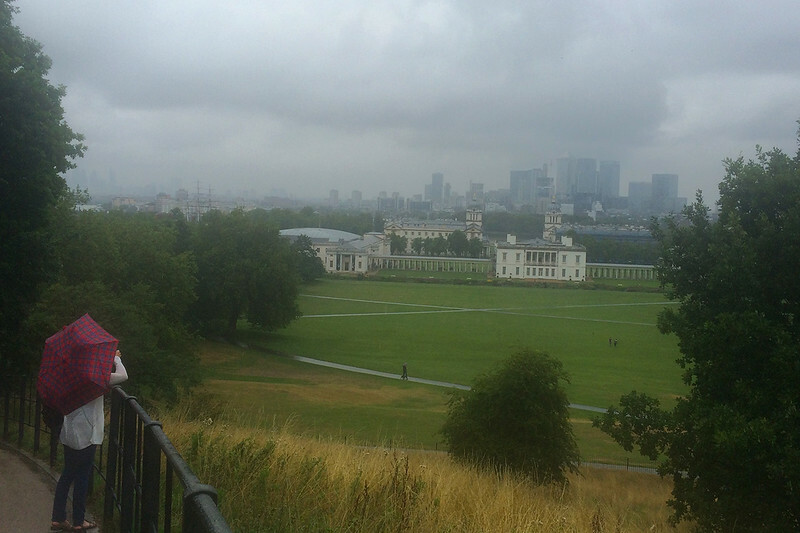 Greenwich on not the nicest day, weather-wise. If you’re looking for places to visit in south east London and are strapped for time, you should at least take a trip out to Greenwich. I can’t think of many sites around the city that have more historical significance than this area. There are many reasons to head to the area, but perhaps the coolest of all is the prime meridian, which is based at the Royal Observatory. As an astronomy nut, I also love the Planetarium, because space is awesome. And I don’t think I’ve ever visited Greenwich without heading straight to Goddards, for a traditional English pie, served with a side plate of jellied eels. Yum! Bermondsey Arts Club may now be a very trendy speakeasy – but it was once a place for urination. Having been spruced up and surely scrubbed with disinfectant from head to toe, the club is now a popular place to head to for delicious cocktails. 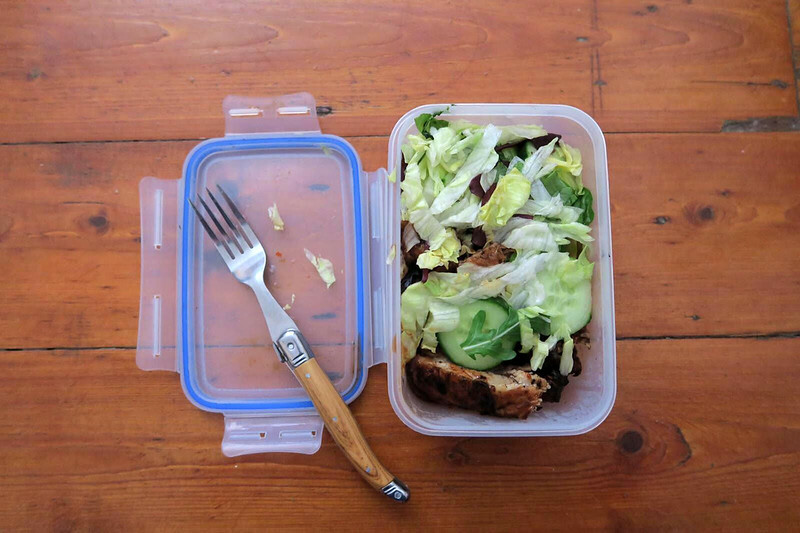 (Make sure you get in there early – it’s a small space and is very popular with the after work crowd, like most of the pubs in this city, if we’re going to be perfectly honest). Maybe you could go do the London Loo Tour and then go for a tipple in the Arts Club afterwards. It would surely keep in with the theme of the night. This view goes all right. You may have noticed that a recurring statement in this post has been “‘x’ place in South East London has good views”. And it’s the truth of the matter. London is such a pretty city when you’re on the outside, looking in (okay and when you’re walking through it too. It’s fine. It’s fine then as well). One of my favourite parks in the Borough of Lewisham is on top of Blythe Hill. It’s quiet (yet another lovely element of SE London) and you can catch some mighty good sunsets from it in the summertime, making it the perfect place for picnics, I should think. Severndroog Castle is a tower that can be found in Oxleas Woods, within the Royal Borough of Greenwich. It was built in 1784 by Lady James, possibly as a memorial to her husband Sir William James, a year after his death (he allegedly died at his daughter’s wedding festivities, which would have put quite the damper on the event). As it was built on Shooter’s Hill, one of the highest points in London, the castle was used as a lookout in both World Wars. Saved from private developers for the use of the local community, it now functions as a mini-museum and a venue for weddings and events. 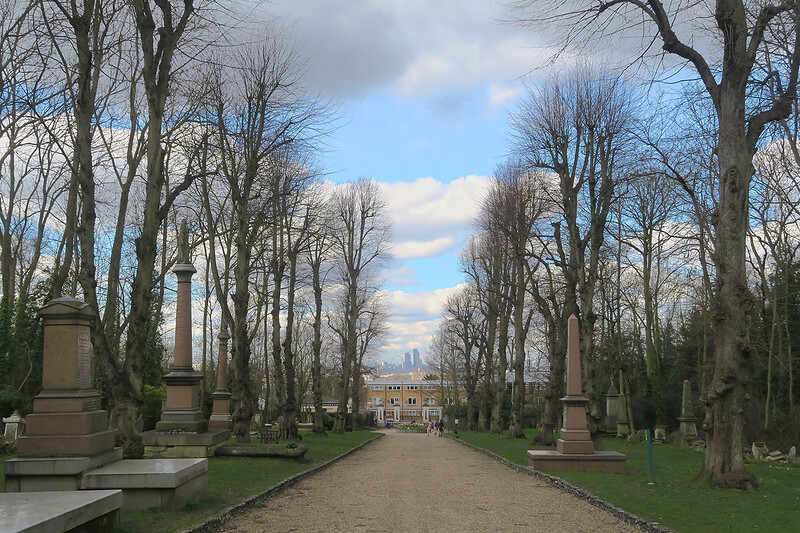 If it’s one thing London does well, it’s cemeteries. The Magnificent Seven are seven (duh) cemeteries throughout London that were built in the 19th century to prevent overcrowding at local parish graveyards. Two can be found in South East London – Nunhead and West Norwood Cemetery, respectively. Nunhead in particular is one of my favourites in the world – wild and overgrown, it fell into general decay by the mid-20th century. It’s now a Local Nature Reserve and can be explored either solo, or as part of a guided tour. Every now and then, the museum has open days where you can explore the crypts below which would be spooky and awesome in equal measures. Britons love their football and upon meeting, will normally not hesitate to ask which “team” you support. I chop and change my mind at will, but will often reply with Dulwich Hamlet, who are known as being the most hipster football team in London. It helps that the scarves are pink and blue, but support of the team has come to mean a lot more than just a love of football – it’s fun, it’s fresh but it’s political too. With traditionally a strong Afro-Caribbean population, South East London is home to the most delicious jerk and fried chicken that you will ever taste in your life. It’s worth making the journey down south for that and that alone. I didn’t even like fried chicken before I moved to London and now I am a convert for life. Head straight to Morleys if you want to taste the best of the best (note – fried chicken is best eaten whilst watching British trash reality TV. I have researched this extensively). 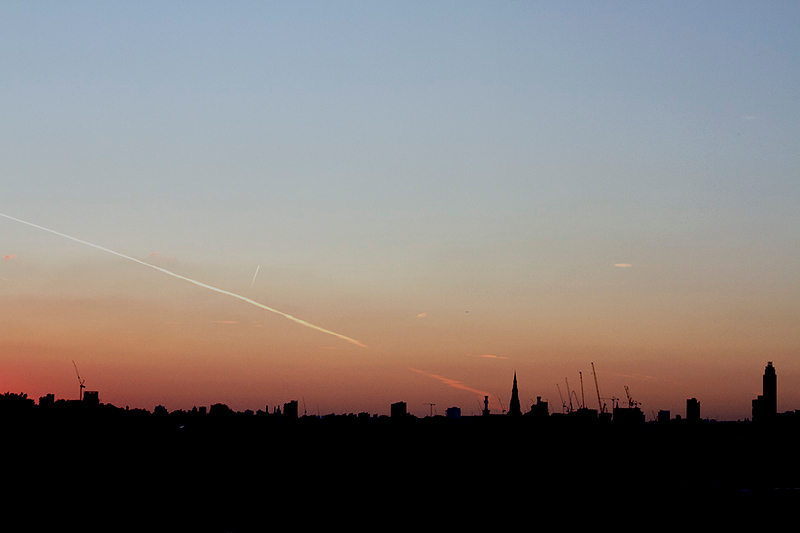 On top of Peckham’s rooftop cinema. I dunno about you, but I love a bit of outdoor cinema. 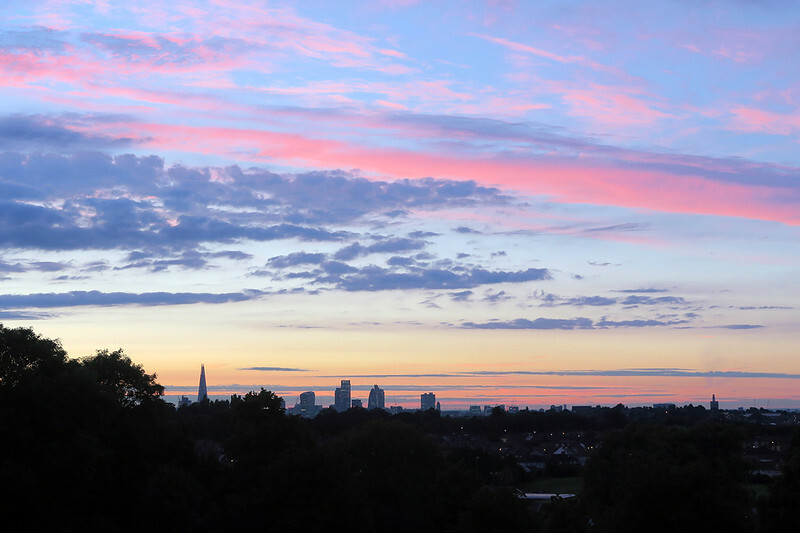 Peckham’s Rooftop Cinema is one of my favourite haunts – the choice of flicks is generally decent and you got a marvellous view of the city, to boot. The only thing I would say is to bring many layers, no matter what the time of year. I’ve been to outdoor cinema in the middle of summer in London, where I’ve been freezing my toes off by 9pm. I once saw a guy bring a sleeping bag to a flick outdoors and I reckon he is probably the smartest man alive. London would be waterlogged without the Thames Barriers, which are responsible for monitoring the tidal levels of the river. They also mark the end (or start – it depends on where you’re coming from) of the Thames Path, where you can follow the river for 184 miles (almost 300 kilometres and in only understanding the distance of kms, I’m finding these conversions very big and stressful) into the sea. I love how futuristic the Thames Barriers look (thank you, 80s designers and architects) and also may have had heart palpitations whilst looking at photos of what the city would look like without them. We owe them a bundle, that’s for sure. Up to my knees in mud in Deptford Creek. Deptford Creek runs straight into the UK’s most famous river – the Thames. Each day, the tide drops low enough that the creek can be explored on foot. 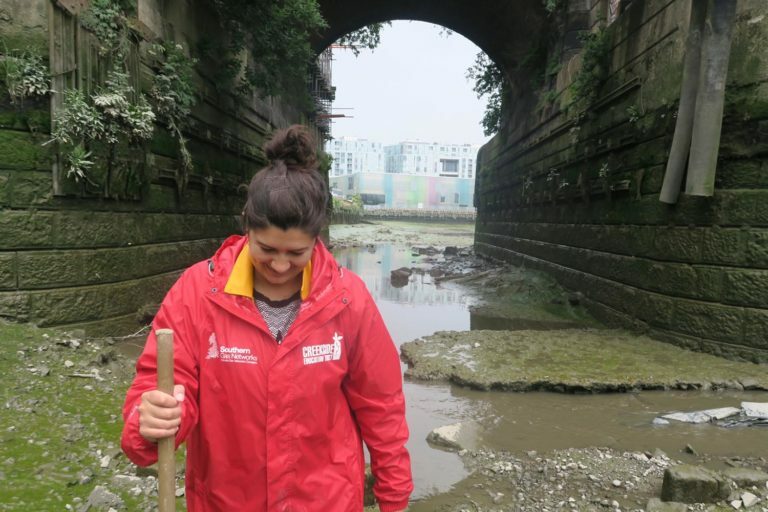 So, the Creekside Discovery Centre in Deptford run monthly tours, where you can pull a pair of wellies and waterproofs, grab yourself a walking stick and go check the creek out in all its muddy glory. Turns out that London is bustling with all sorts of animal activity – beyond pigeons, squirrels and rats. From leeches, to shrimp, crabs, flounder and a range of birds, there’s plenty of fauna (and flora) who call Deptford Creek home. How many times have you been in a club where you’ve been utterly disappointed by the low quality of the music? (Or in some cases, where the quality just hasn’t been quite bad enough). Silent disco has always seemed like the clear answer to this ongoing conundrum – and what better place to hold it than in Greenwich’s own Cutty Sark sailing ship? It’s an event that you have to look out for and it seems the next one is happening on the 15th of December this year – you can buy tickets here. That’s enough to keep you busy for at least a weekend – it is a corner of London that kept me occupied for almost two years. And even though I no longer live in the city, South East London has an enduring place in my heart (Lewisham ’til I die). When I stay in London and I can’t beg a bed (or floorspace) off my friends there, I stay at Grange City Hotel, which is right near Tower Bridge (but on the boring, north side, haha). 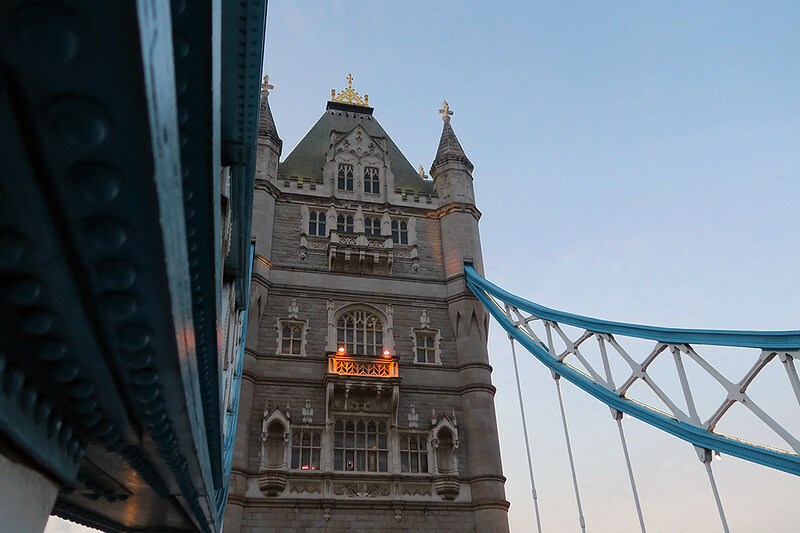 If you want to be a bit closer to SE London, Premier Inn Tower Bridge and Bermondsey Square Hotel are both close to transportation that’ll get you just about anywhere on this list. If you want to try something really special in general – why not spend the night in a Harry Potter-inspired Wizarding Chamber? Heading to London? Pin this post for future reference. Puppy-stalking is one of my favorite pastimes lol. Glad to know I’m not the only one who creeps on cute dogs (I’m about to go to a cafe w/ a window seat to do it actually (I’ll pretend to work in the process). Great list though…. hope I get to explore this part of London deeper one day! Nope, you are not alone in this! Puppy stalker fo’ lyf. I hope you do too, as I think you’d like it. We live in south-east London and I LOVE THIS!! You’re right – Dulwich Hamlet really are the most hipster football team – probably in the world. Their supporters pack olives and craft beer where others pack tins of beer and pies. Which I love! (I mean pies are great, but still. It’s nice to see people bringing a touch of class to football games, haha). It’s the best part of London and there’s so much to do there. I feel I’ve only touched upon it in this post! 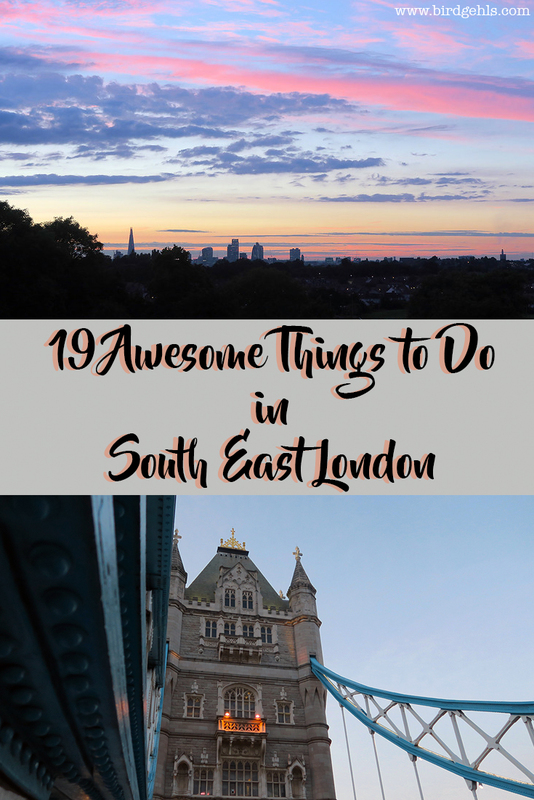 I would love to explore London a little bit more because this is a very interesting list! 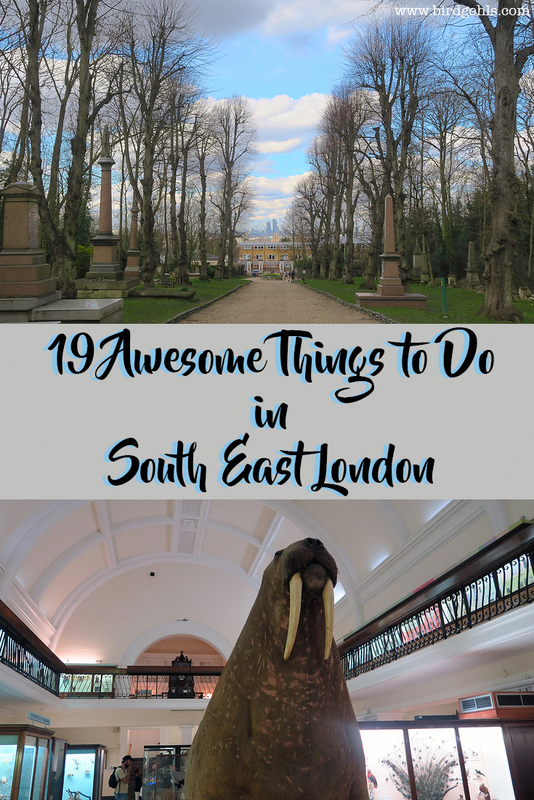 I love that you can never run out of cool things to do while in London! Thank you so much for sharing this. Saw the Thames Barriers in 1999 – I thought I was a total nerd for wanting to do that! Others go shopping or visit the Tower, and I went to the Thames Barriers (and strolled around Greenwich)… haha. If I ever went back to London, I want to see the dinosaurs!! And wrinkle-free walrus!! Aw thanks lady, I aim to please! They’re so cool, hey? I really enjoyed seeing them (and thought I had a pic, but it’s completely disappeared, it would seem!). Both the dinos and Walrus are worth a look in, for hilarity’s sake at the very least. I love this post! 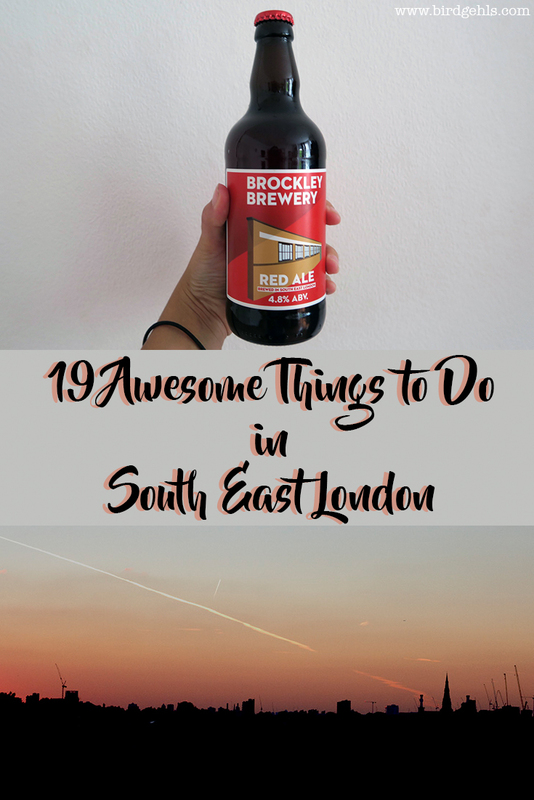 I live in South East London and still haven’t done most of this… one of those things where you think you have all the time in the world and never get around to it! I’ve never heard of the Green Chain Walk but I think I might attempt it now!